My Scrappy Life: A bit tired...in a good way. A bit tired...in a good way. Just got back (yesterday) from the mission trip in Joplin. 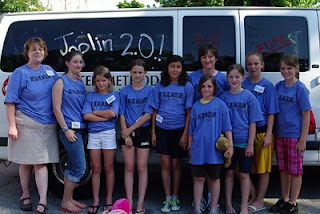 I took 7 middle school girls and 1 high school girl (my assistant director), along with a mom (and great help!) for a four day, three night mission trip to Southwest Missouri. You can read more about it on the kidz blog. You're looking good, by the way!